Most music fans feel that they have to assign an artist to a particular type of music. In our ordered lives, it is easier to do this. We don’t like things that don’t fit neatly into a particular stereotype. It is like an itch that you can never scratch. I have said this before, the danger of classing something in this way is that it will alienate people who are not fans of that particular musical genre. So we may like to be ordered but, in doing so, you may be committing commercial suicide. 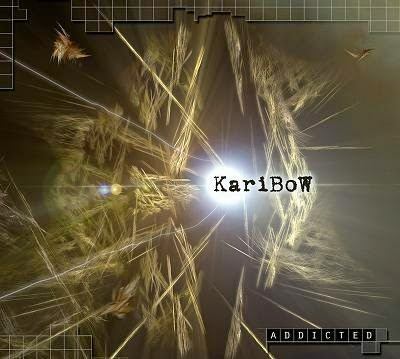 German band Karibow, despite winning Germany’s ‘Best Progressive Band’ award in December 2014, tend to be labelled as more of a pop/rock type of band and this has, no doubt, been detrimental to there efforts to stride forward into the progressive arena in a big way. Their latest album ‘Addicted’, released in October 2014, tends to weave its way between pop, rock and neo-progressive rock and merge into a rather contemporary whole. You guys know that I always give an album multiple listens before I commit any words to my reviews. Well, it was no different with ‘Addicted’ and I found my opinion and my review changing on almost a daily basis. It has taken a while but I now feel I am ready to write my review of this conundrum of an album. 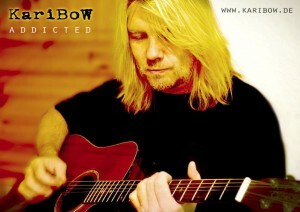 Karibow was founded by Oliver Rusing in 1997. Numerous albums have, over the years, documented a long musical evolution that lies somewhere betwixt progressive rock and electronic pop/rock. Originally started as a studio project, Karibow has expanded into a five piece live band. The line-up is now Markus Bergen (keyboards), Chris Thomas (guitar, vocals), Gerald Nahrgang (drums), Thomas Wischt (bass) and Oliver himself (vocals, guitar). One thing Oliver doesn’t lack is ambition, 16 tracks play out over 78 minutes. The question is, should less be more of does each song have its place in the overall musical jigsaw puzzle that is ‘Addicted’? The album begins with Change which is a catchy, toe tapping track straight from pop/rock central. Immaculately polished and presented, it is a shining example of Oliver Rusing’s song writing prowess. Like an amalgam of Train, U2 and Maroon 5, it doesn’t try to be anything other than a well crafted tune with silken vocals, an excellent rhythm section and a gleaming guitar solo. There is an immediate segue into a more progressive style with the eight minute plus Primeval which has a sultry feel to it. Deep and thoughtful, I would maybe call it mellow-prog as it leads the listener into the track at a measured rate. Definite hints of later Marillion here yet it treads its own steadfast path. The guitar work is more intricate than on the previous track and the vocals are really starting to stand out with their breathy style. A nod must also go to the excellent production that seems just about spot on to my admittedly amateur ears. There is some classy stuff on show here. On Liquid Terrain and Believe have a real 80’s bass line like Mark King of Level 42 has joined the fun and that 80’s feel carries on throughout these two, funky songs. Like an amalgam of 80’s synth-pop and a touch of progressive rock, they waft through your conscience, almost insubstantial but held together by great rhythm sections and superb choruses . Oliver can write excellent pop tunes and these two are indicative of that. Now onto one of the stand out tracks on the album for me. Home of Cain begins with a cultured and elegant introduction that breaks out into the first chorus which is a thing of beauty. A gentle and amiable song that just leaves you with deep seated feeling of well being. The keyboards and vocals are at the heart of this track, graceful and refined, they add a fragile dignity that fans of 90’s UK band Lighthouse Family will be familiar with. 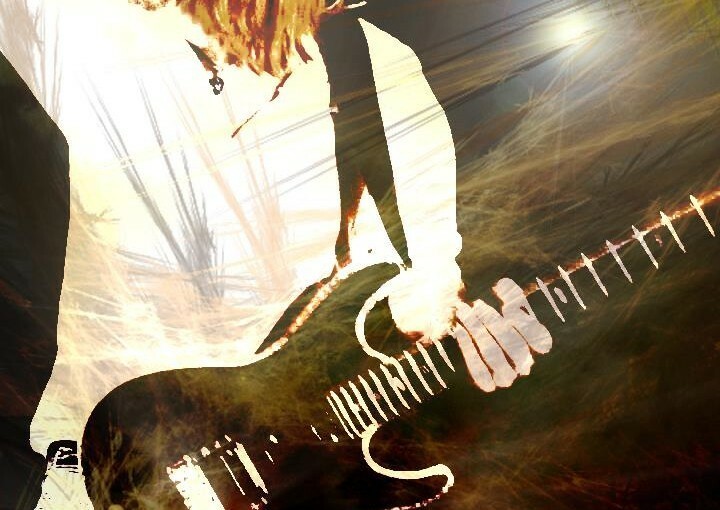 Stella Nova and Shine On showcase that precise blend of pop/rock and progressive rock that seems to be becoming a hallmark of the band, the former majoring on progressive and the latter with a stronger hint of pop. An urgent staccato riff leads the verses and things get a bit more complex with the choruses. The accomplished vocals and well executed guitar work are signature on these two tracks and the uplifting feel of Shine On is quite addictive, leaving you with a smile on your face. Collaborator is a serious and complex track that is, in my opinion, criminally short. I love the darker feel that runs throughout the song, emphasised by the edgy bass and guitar and the strident keyboard note. The vocals have just enough mystery about them too. Possibly the most commercial track on the album, The Cry is, perhaps, too flawless and loses some of the appeal of the rest of the songs. There is no doubting its skill and urbane suaveness but I prefer the flawed gems that make up the rest of the tracks. Now I’m guessing that the title of the next song may have something to do with the dark art of Chess but it is only a guess but, as for the track itself, F8 A1 Ba6, is one of those flawed jewels I was talking about. A really restless and skittish instrumental that grates at your nerve ends leaving them bloodied and worn, it is a clever little piece of music that makes you sit up and take notice. Running at a pace that never lets up and never allows you to gather your thoughts, I really like its nervous energy and off kilter feel. Like it was deliberately put there to soothe your raw edges after the previous song, Spark is a tender piano and vocal composition that gently tiptoes across your psyche and leaves you calm and collected. The intro to Place to Be builds up slowly and genially before the guitar and vocals kick in. Impressive drum work and a solid bassline lay the foundations for what is quite a distinct track, almost anthemic in flavour. I could see this becoming a live favourite, with its sing-a-long chorus and excellent guitar work, it just feels, well, right…..
A harder atmosphere pervades The Violent Plains and it gives the feel of another crowd pleaser. The guitar, drums and bass all exhibit a quality that you can perceive and you will find yourself singing along to the chorus. Unashamedly slap bang in the middle of the rock arena with pop leanings, who cares when it is this good? Moving on to Always There and that instant wow factor I got from House of Cain returns. Channeling their inner ‘Wilson’, Karibow have produced a superb song that really hits you right in the heart. Expressive, heartfelt vocals, a wonderful guitar and a piano that dances around your aural perceptions all combine to deliver a track that lingers long in the memory. There was always going to be a come down after the delights of the previous track and the fact it is only a minor one is testimony to the effusiveness of Something. Upbeat and decidedly cheerful with glorious keys at the heart, it really shines and radiates a warming glow. Now to the final track on this saga, 9/16 finishes things off with a song that has both feet firmly in the camp of Prog. A forceful intro leads into a track that has a sheen of seriousness hanging over it and one that is delivered with gravitas. The jangling guitars and upbeat chorus remind me a little of U2 but with a much more suave feel and the whole song drips with a personality that is eminently noticeable. As the closer on the album, it steps up to the plate and delivers emphatically. So what have we got here? Well, to my ears this is decidedly a rock album but one with considerable progressive rock leanings however, at the heart of it, why pigeonhole it as one or the other? Can’t we just call it decidedly good music that’s worth listening to? When I first listened to it I did think there may have been one or two tracks too many but, having revisited it quite a few times, the album would be poorer if it was missing any of them.